The fallen helmets on the ground seem to have a nasal attached to them, but interestingly none of the helmets that are being worn show them. dated to the 11th century. This wouldn't really fall under the spangenhelm classification, since there are no bands keeping the plates together, but instead they are riveted to each other. 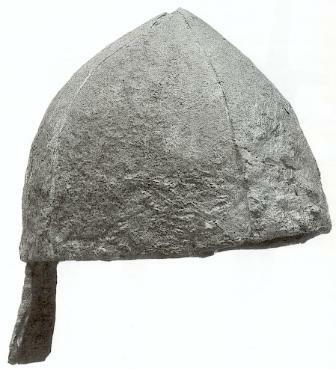 Helmets of this type seem to be depicted in the Leiden macabees, suggesting that helmets of this type were in use from the first half of the 10th century. However this is not the type of helmet i am talking about, as there are no bands holding the plates together. So what are your thoughts on this subject? I would love to read some discussion about this as well. The lack of surviving examples can be maddening. This discussion from 2011 does have some good thoughts and links, in case you haven't seen it.